Love isn’t something you say, it’s something you do. 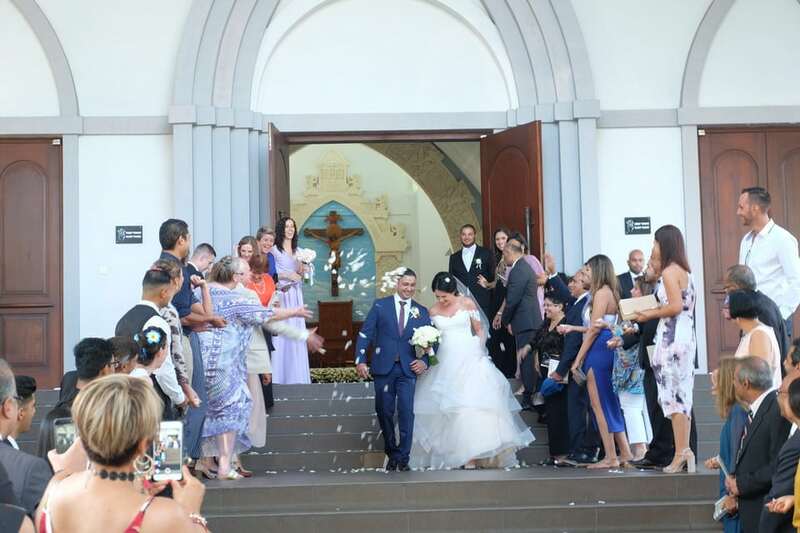 For the newlywed couple, Inga and Marc Moniz, they have taken the action of making the public and legal joining of their lives in front of their family and friends on Saturday May 19, 2018. Inga contacted us last year in July 2017 regarding their plan to have a wedding in Bali. She is the friend of our previous client, Simi. Inga wanted to have a wedding ceremony in a chapel or church followed by an outdoor wedding reception at a hotel with 80 guests. 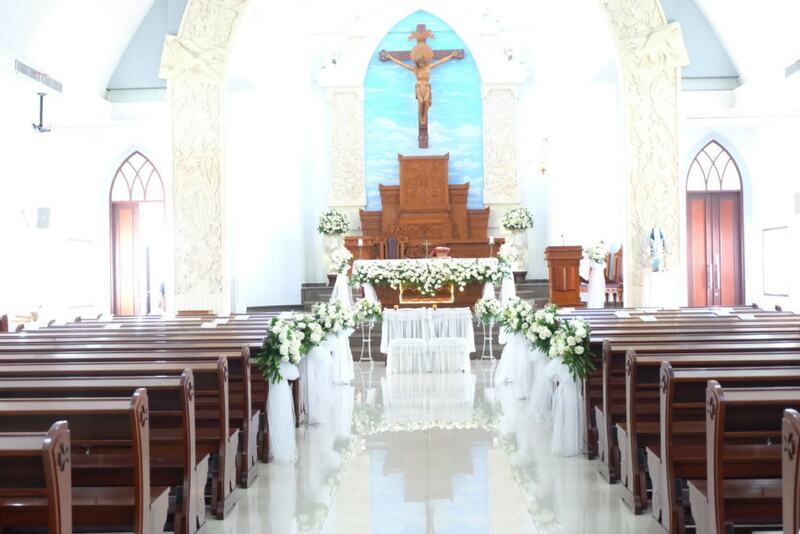 We suggested to Inga and Marc a couple of options regarding wedding requirements and styles, eventually the decision came to Mary Mother of Nations Church in Nusa Dua for the wedding ceremony and Grand Hyatt Hotel for the reception, just a mere 10 minutes away. 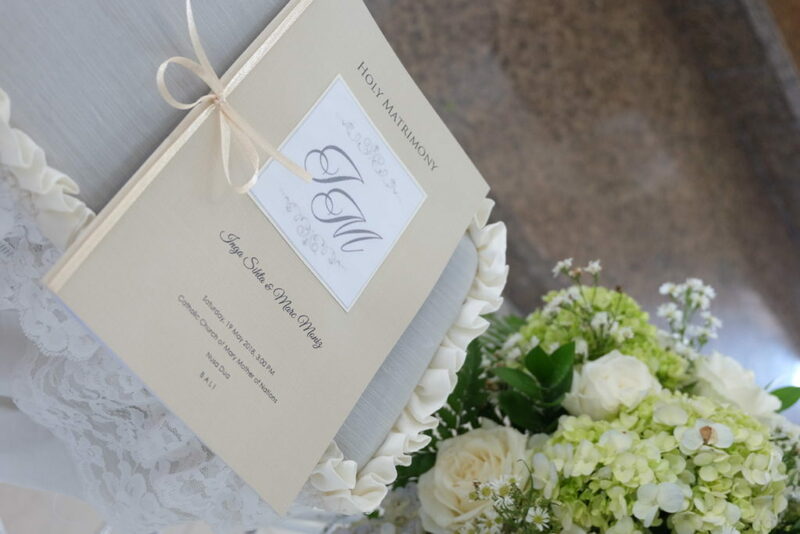 Inga hired our Full Wedding Planning Service where we took care of everything from venue, ceremony & reception arrangement, floral design, styling, transport coordination, photo, video, makeup and food & beverage. Inga wanted to have white and green flower decoration for the wedding so we came up with the concept and once she approved, we discussed with the florist and venue to get it done. On the wedding day, the church has been decorated in a fashion where white roses and gerberas with green hydrangeas dominated the altar while white tulle helped to embellish the pews. 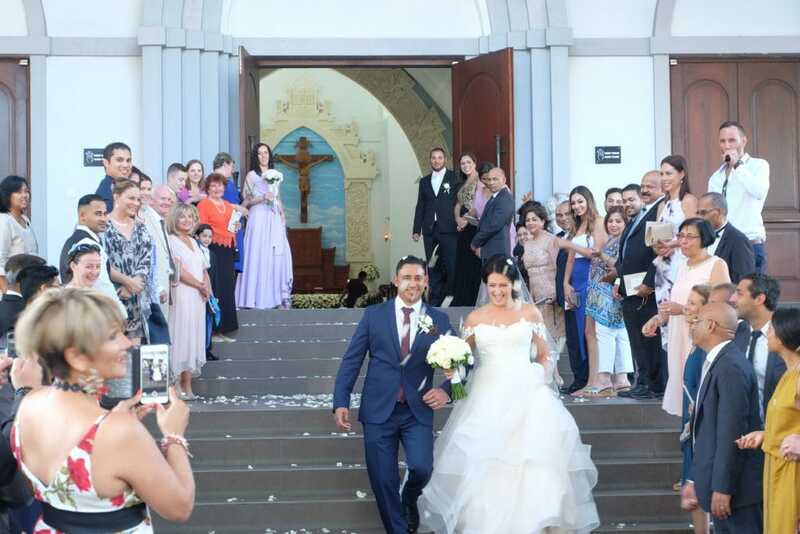 After the traditional ceremony, they had their wedding reception at the Salsa Bar in the Grand Hyatt Hotel, which is one out of the many world-class resorts situated in a pristine coastline, uncrowded beaches and a culturally enriched community. 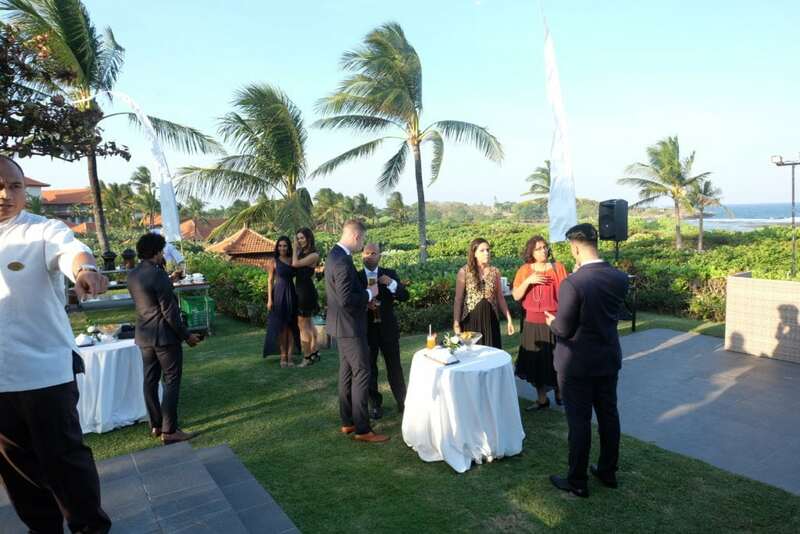 The Salsa Bar was great choice as it was situated atop a hill where it benefits from cool ocean drafts and stunning panoramas of the Nusa Dua coastline as well as the incredible sunset views. 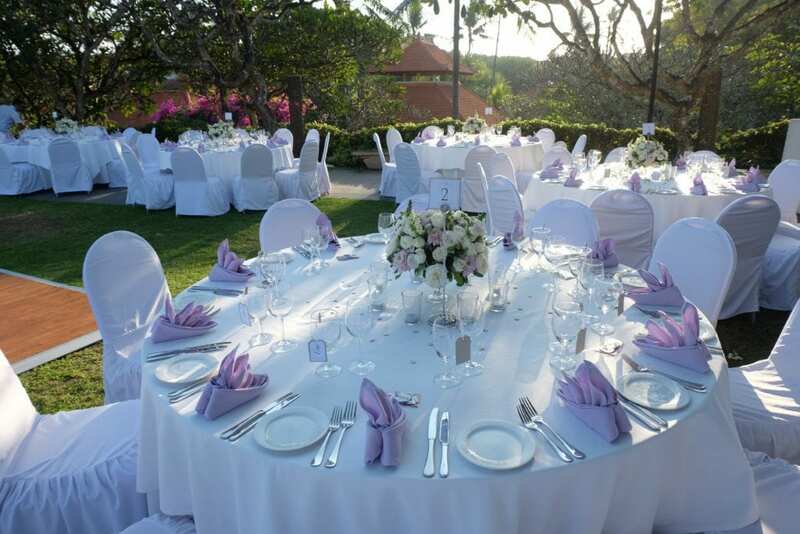 An arrangement of white roses and lilac chrysanthemums with green hydrangeas in the middle of the table served as a centerpiece, while white linen covered chairs and tables with lilac accents on the table napkins. 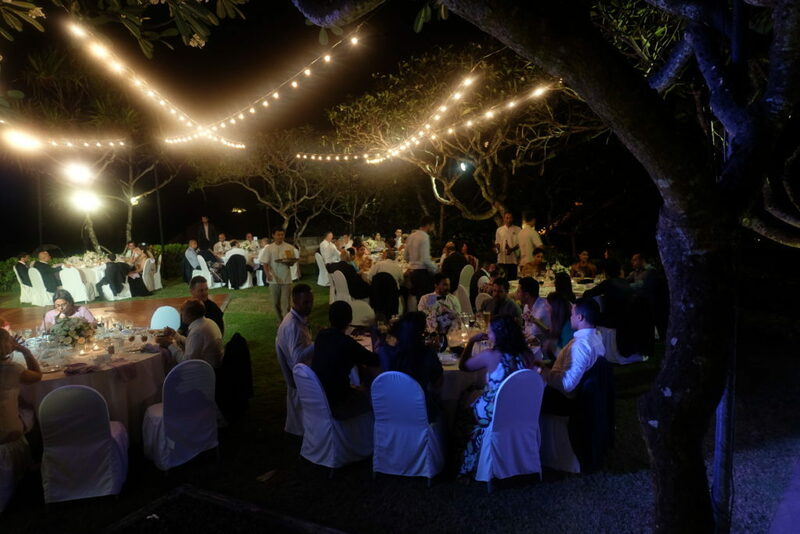 Light bulbs scattered across the sky connecting themselves in Frangipani trees towering the tables and bar gave it a mix of a sophisticated yet earthy feel as a Balinese bale provided shelter from the sun’s final fading rays. No wedding is ever the same, but each one has to have moments where they tug at your heart a little bit and this wedding had no exceptions. 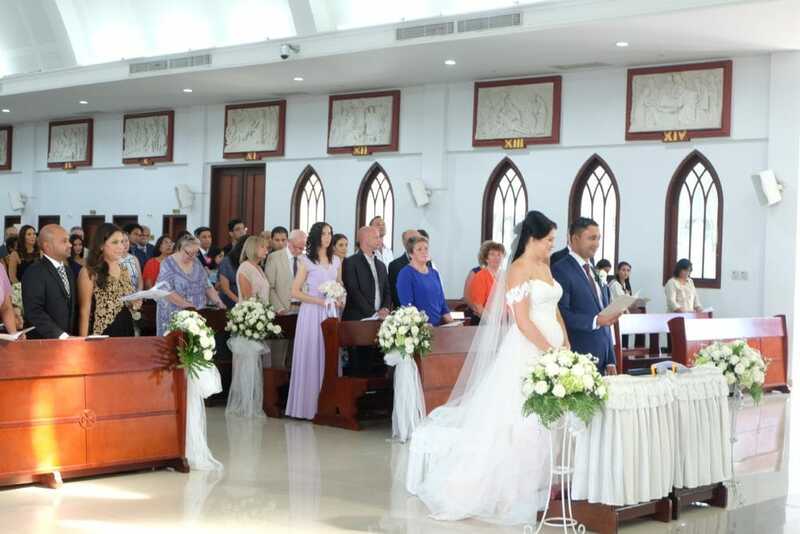 Having the bride and groom from different countries, family and friends with different backgrounds came together from different parts of the world to witness this beautiful unification. Touching speeches has been said and even I have to admit, shed a tear along with everybody else. But amidst the emotional ride we were taken on, there were also some entertaining moments where few guests participated in the games. The most popular game being the “shoe game” where the bride and groom held each other’s shoes on one hand and their own in the other. This game in particular though had a twist where three other couples joined in ranging from newly engaged, 1 week married and 33 years married. Questions were asked to see who the boss of the relationship is, or who takes off their clothes first in bed for example. My personal favorite game was the last one consisting of ping pong balls. You’d think with alcohol around, a nice competitive beer pong challenge would happen, but boy was I wrong! 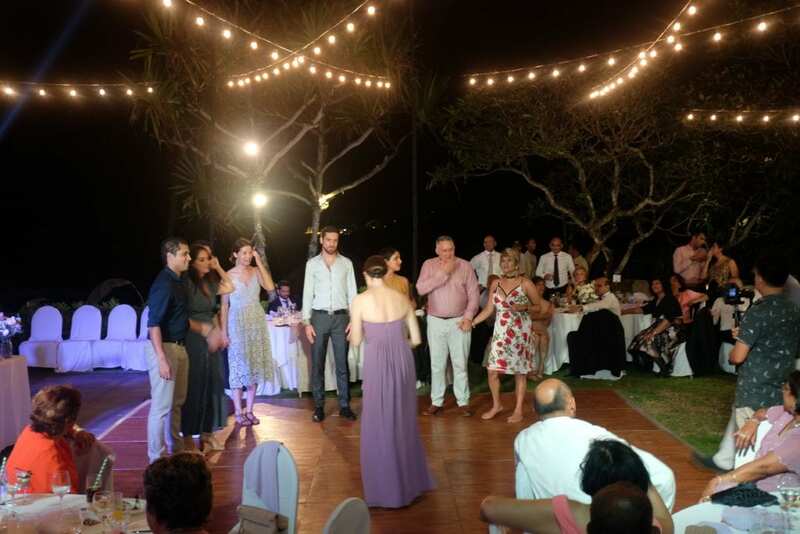 The MC has asked all couples to come up to the dance floor and stand in front of each other and have the women place the ping pong ball inside the men’s clothing and move it up and down their clothes without using their hands! This came to be the most comical moment of the night and it was immediately topped off with lots of dancing to Macarena and Wham! Each element throughout the night was able to capture the essence of love through wind, the sound of waves crashing upon the shore, laughter from close family and friends, and the smiles on each and everyone’s faces.